Nicaragua! Already! Past the halfway-mark of Central America! Honduras was dry and friendly and mostly closed for la Semana Santa (Holy Week), a 10-day vacation leading up to Easter observed by most of Latin America. We blew through the country like a fell wind and crossed into Nicaragua just the day after yesterday. The border was uncomplicated. We changed our lempiras into cordobas with a jovial money changer and paid our $7 entry fee to customs. A border guard dropped the white rope tied across the highway and we pedaled on into the tiny town of El Espino. Within a kilometer, the road was completely deserted. 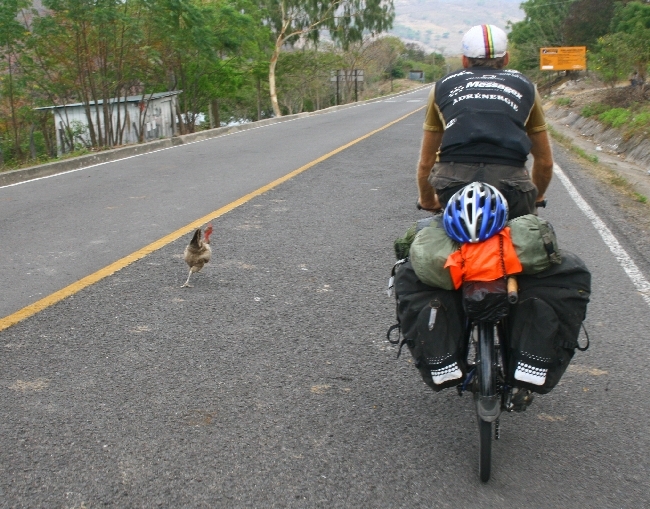 Okay, it was Easter Sunday, but even so we were surprised to see chickens pecking around in the middle of the Pan-American Highway. After a night sleeping in a pasture near Somoto, we made Esteli yesterday in the early afternoon. It’s a bustling town of about 120 000 surrounded mostly by tobacco fields and cigar manufacturers. We looked up our Cyclo Nord-Sud partner here, the Nicaraguan Association for the Blind (Asociación Nicaragüense de No Videntes or ANNV) and stopped in to say hello and see where the bikes go. Excellent question. Momentito, por favor. The 20-year old ANNV provides elementary education for visually impaired children. They learn to use Braile and then follow a standard curriculum. Afterwards, they’re integrated into mainstream high schools. The Association offers room and board for students, who come from various regions of Nicaragua. Their mission is to help integrate visually impaired Nicaraguans into society, and they rely on their own fundraising initiatives to operate. That’s where the bikes come in. The ANNV runs a shop in downtown Esteli where the donated Cyclo Nord-Sud bicycles are fixed up and sold to locals at a decent price. A lot of people here work in the fields or factories outside of town and use bicycles to get to and from. Canadian bikes and parts are considered to be of high quality and draw a large customer base. Most come to the shop hoping to get their hands on a coveted mountain bike, which is ideally suited to the area’s rough and hilly roads. Lucie and I slept in the shop to get a real feel for the place. We pitched our tent in the showroom, surrounded by piles of bikes that travelled almost as far as we have to get here. We chatted and watched awesome Nicaraguan TV with Juan, the friendly night watchman. This morning, fresh and rested, we stopped by the school down the street to talk to the students, teachers and administrators. The head teacher introduced us. Each student then stood and introduced him or herself and said where they were from. They demonstrated their mastery of their portable Braile writing machines. They wished us safe travels as we rode off. It was pretty touching. Tonight we’re staying in Esteli to soak up the place. We’ve opted for a hostel in order to grab a hot shower, ditch our bikes and catch up on internet stuff. We may even watch a movie! I for one am feeling the need to tune out. As we ride further south, things are becoming more and more stripped down and basic, from housing (sometimes just mud and sticks) to available food. Nicaragua is technically the poorest country in the Western Hemisphere after Haiti, and you can feel it in the air. Signs everywhere denote various foreign aid projects. Huge numbers of Nicaraguans seeking work emigrate every year to more industrialized El Salvador or Costa Rica or beyond. Even though we’ve been outside of Canada’s sanitized, convenience-oriented middle-class reality for several months, every once in a while the total lack of familiarity kind of creeps up on me. It’s a good night to watch Titanic or something. Tomorrow I’ll be a totally well-adapted Pan Am cyclist. Tonight, I eat popcorn. I am posting very late, probably after the fact. Do you contact for the school? I work as a Teacher of the Visually Impaired in California and could think of some gently used equipment that this school might want. Thanks for posting photos and visiting this school. I didnt know about this before. Esteli is a great place. Yes, Nica can be a bit basic, but it is one of the safest places in the Americas and the country is developing quickly. People are very friendly and know who they are. They are more invested in their family than in making money and are very authentic. I hope you enjoyed visiting.